The cast of The Maids. Photo by Theo Coté. BOTTOM LINE: This French-language production of The Maids is visually stunning and full of strong performances and visions, but may send audience members reeling from abundant mental stimulation. Between its ambiguity, lack of traditional narrative, and boldly drawn characters, the work of absurdist playwright Jean Genet is inherently difficult. 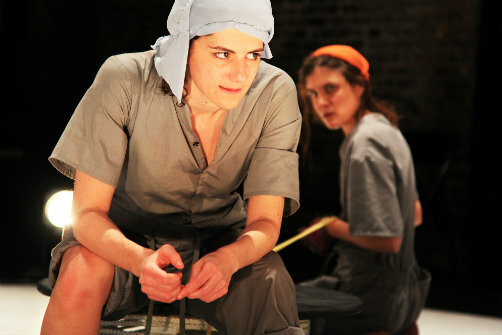 Tackling it in French for a primarily English-speaking audience, however, is a different animal entirely, and Oliver Henzler’s production of The Maids (en français: Les Bonnes) at La MaMa certainly makes a valiant effort. Solange (Hélène Godec) and Claire (Laura Lassy Townsend) are two maids who spend the majority of their time staging and acting out their fantasies of overthrowing and killing their mistress, who is referred to only as Madame (Cloé Xhauflaire). When the play opens, they are on their own in Madame’s house; they have begun orchestrating a plot and have managed to get Madame’s husband thrown in jail. This is only the first step in their scheme, which is played out between the two in excruciating detail, repeatedly, to brutally murder Madame and everything she stands for. However, their confinement to routine and repetition is ultimately a hindrance, and they never can seem to actualize these fantasies. Lloyd Huber’s scenic design certainly doesn’t help set them free—the two actors are frequently restrained by rubber gloves that are attached by stiff elastic to a platform center stage, and this limits their movement to a much smaller radius. Godec’s and Townsend’s physicalities work seamlessly with this design to create a strong movement-based performance that is visually very evocative. One major new element not originally in Genet’s text is Leah Lawrence’s live musical compositions. Lawrence, who sits just offstage with her guitar for the whole show, scores the piece with various French/English blended songs and the occasional sound effect. The songs, devised through improvisation during rehearsals, do not propel plot, but rather establish subtext and tone. While the music and lyrics often feel a little too blunt for the language and vibe of the rest of the piece, they do foster a sincerity and a spirit of collaboration that is noticeable in the performance. Personally, I always love the idea of doing a play in its original language, no matter whether or not the intended audience knows that language. And this production certainly squeezes the poetry out of the original French. Of course, the supertitles allow English-speaking audience members to understand the plot. But whether because of the placement of the screens, or because of the intense physicality of the performance, one's focus is always divided. Look away from the screen and you miss plot points, but look away from the performers and you miss the beauty of the action, and their commitment to their roles. What Henzler, Townsend, and l’Atelier Théâtre have taken on with this production is an absolutely gargantuan task, and they have created a compelling piece of theater. Where they fall short is that there is, sometimes, simply too much going on. What I would suggest to a (non-francophone) audience member is this: read the play—or an excellent synopsis of the play, gain an understanding of its basic plot, and then ignore the supertitles and just focus on the action. It’s a lot of prep, but it's ultimately the best way to understand and appreciate everything that is happening (and trust me, there is a lot happening) in this layered production of The Maids. The Maids (Les Bonnes) is by Jean Genet. Directed by Oliver Henzler. Musical Composition is by Leah Lawrence. Set Design is by Lloyd Huber (asst. Giovanni Di Girolamo). Lighting Design is by Oona Curley. Costume Design is by Lorrain Smyth. Graphic Design is by Raphaelle Rico. Subtitles are by Lucy O'Brien, Mariam Moustafa, and Ellen Thome. Stage Manager is Andrew Carr. The cast is Hélène Godec, Laura Lassy Townsend, and Cloé Xhauflaire.